It's just 4 more days to our nation's 50th birthday! Have you made plans on how to celebrate this long weekend? For us, we have booked a chalet for 3D2N starting next Monday and are looking forward to having a good time playing, swimming, bowling, singing, barbecuing and catching up with our families. 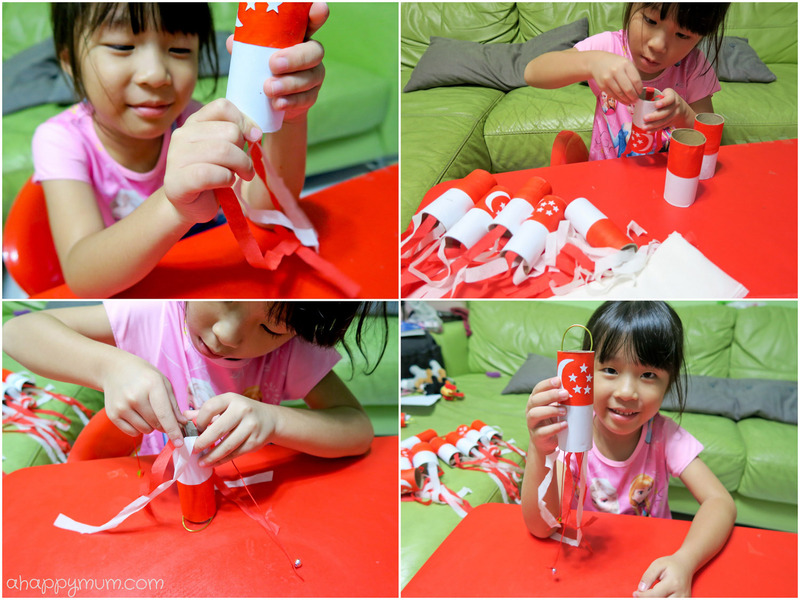 Remember how we made maracas, parade wands, flags and buntings to decorate our chalet two years ago (tutorial here) and our DIY paper visors last year (tutorial here)? This time, I wanted to make something creative and speaks of patriotism. Think: a chalet where it gets windy, sometimes a little too quiet, and looks a little dull at the porch or doorway. What can we possibly make and use to brighten up the mood so that everyone who comes will feel a warm welcome? In this week's Creativity 521, we share with you something simple and fun that we did - DIY National Day Wind Chimes made out of our stash of toilet rolls. Firstly, I measured the height of the toilet rolls which was 10cm. Then I cut up stripes of A4 sized plain paper lengthwise into two sets of widths 5cm and 6cm. Next, it was time for some colour! The kids helped to paint the 5cm-strips red. It would have been easier for me to cut up and use red paper instead but there's always fun in painting, right? While waiting for the paint to dry, we started to wrap and stick the 6-cm white strips of paper onto one end of each toilet roll. I find it easier to ask the kids to apply glue by using paintbrushes to dab along the border and corners of the paper. Once the red strips are done, we similarly stuck them onto the other end of the toilet rolls. Tip: If you have guessed it, the extra 1-cm is to ensure that the red and white strips overlap nicely in the middle and leave no gaps. After that comes the more delicate part! I helped to cut out the crescent and stars so that they could stick this onto the toilet rolls. At that moment, I wished I had a star shaped paper punch because stars are not really the easiest shapes to cut, especially tiny ones. Still, I managed to cut out more than 15 moons and 75 stars so that we could make at least 15 wind chimes. Tip: Search online for a Singapore flag outline and crop out the crescent and stars. Resize it to fit the red portion of the toilet roll and duplicate it as many times as you need in Photoshop or other software before printing it out. You know, I was really pleasantly surprised by Angel's patience in sticking the crescent and especially the stars. She made sure she improved with every toilet roll and got the stars to form a nice round shape eventually. I even told her to take a rest and let me finish up the rest but she said "It's okay, Mama. I'm tired but I don't want to give up" which left me a little dumbfounded but happy nonetheless. As expected, the toddler had already run off by now to play with her toys so I was glad that I had some one-on-one time with the determined big girl. Following that, we cut the crepe paper into long, narrow strips of approximately 20cm in length. 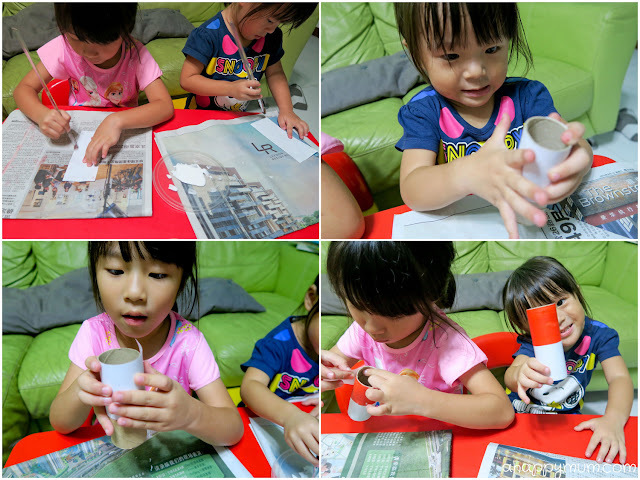 Using scotch tape, we alternated the colours and stuck the strips onto the inside of the bottom of the toilet rolls. This helps to form a really beautiful tail for the wind chimes and makes it flutter in the wind. Next, we made handles using the thick gold string and secured them in the inside of the top of the roll. Lastly, we wanted our wind chimes to jingle so we tied bells onto the thin red string and stuck them along the inside of the bottom of the rolls. Tip: Make sure the string is long and thin enough so that it only takes a breeze to make the bells vibrate. You might need to use more and bigger bells if you prefer a loud jingle. Repeat all the steps for as many wind chimes as you wish to make! We spent the whole night doing up 15 of them and though it was time-consuming, these were quite easy and fun to make. More than anything, I was glad to have spent a happy, bonding session with the kids. Ta-dah! And we are all done! Before we take these wind chimes to jazz up our chalet next week, I thought we should first put them up in the house so that we can all get into the National Day mood and be excited to celebrate this huge milestone in the place we call home. Happy, Happy 50th Birthday, Singapore! May peace and prosperity be with us always! P.S. We are also teaching the kids to recite the pledge, sing the national anthem and some patriotic songs so that we can build up on a sense of nationalism, have a jolly good time and feel a sense of pride when watching the National Day parade (on TV, I mean, cos' we didn't manage to get the tickets. Still very much looking forward to it!). Have a great National Day weekend, all of ya!